It is customary on Easter to race breathlessly with Peter and John to the tomb of Jesus upon hearing the report of the women that the tomb is empty. And while the Church’s proclamation always echoes joyously this report of the women, I would like to invite you to reflect about its complete accuracy. Should we consider the tomb of Jesus completely empty, or just somewhat empty? Such a question might seem to hedge the great Easter message of the glorious resurrection of our Lord, but I assure you it is not. I simply want to invite readers to do a more careful inspection of Jesus’ tomb to appreciate a more accurate inventory of Who is no longer there, but also who remains. On the mundane level, the texts indicate that while the body of Jesus was no longer in the tomb, the burial linen cloths and the napkin which was about His head were folded up nicely. They remained in the tomb. The big point, however, was that the body of Jesus was no longer wrapped in them. The thrilling message of Easter is that when you go to the tomb of Jesus, what you don’t see, is what you get. This is the one place where the real absence of the true body of Christ is joyously affirmed as Great News. It is finished on the cross gets verified by the One Who is no longer there. It is the negative space that captures the astounding message and great joy of Easter. But not so fast about the tomb being empty! 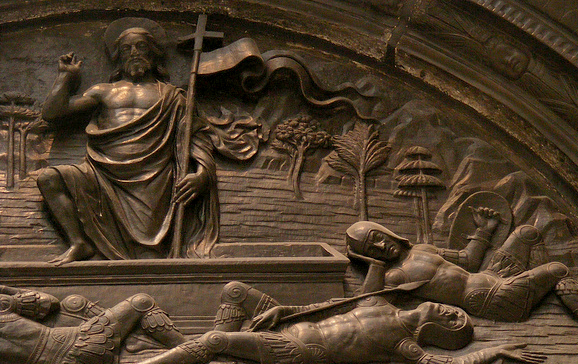 We need to realize that Easter proclaims a now, and not-yet Gospel—both which are intimately connected with the tomb of Jesus—a tomb that is really only somewhat empty. In Romans 6:3-4, Paul informs us that baptism unites sinners by water and the Word to Christ the crucified. There united to Him, He takes all our sins and gives us all His righteousness. And then as He died to sin and proclaimed, It is finished, He took us united to Him into His tomb. Just ponder the thought. All baptized sinners through the ages are joined to Christ the crucified, dead to sin, and tucked away in His tomb! It is a pretty crowded place in here, is it not? The existential question about Easter however is this: Does the Apostle’s final promise to baptized Christians hold water? Have we the baptized, crucified, buried with Him, and dead to sin—do we also get to live? (Rom 6:5) This question is not, Do we get to die to sin with Jesus and rest in His tomb? The question is, Do we get to get out? Today’s culture wants to propose the stupid idea that the cycle in nature of death to new life offers some good news about our problem of death. What silliness! When Adam and Eve were tossed out of the garden, the ground was not rested; it was cursed. As Adam’s body came from the dirt he walked on, it then returned to it. The wages of sin is death, not recycling. The women came to the tomb of Jesus to anoint a dead body out of respect for the departed Jesus, not to prepare for some cycle of return. They came looking for a dead Jesus. There is no cyclical springtime for sinful humans under the curse. Even the most unreligious farmer today knows the difference between a fallow field and a graveyard. Corn cycles, humans don’t. Because of sin there is death. And because of death, there are graveyards. And because there are graveyards, there are loved ones who visit to pay their respects and grieve those who are dead and buried. Christ’s resurrection guarantees ours. We get to get out! Concerning the promise of Easter, the only options are living through faith in this not-yet, or living with a not-at-all. Easter is now for Jesus, not yet for those baptized now living in His tomb, and not-at-all for the rest. Nobody gets recycled. For now, we shout our hosannas and alleluias from the vantage point of our baptism. As we died to sin and were buried with Christ; we for now are locked up in His tomb. Jesus Christ is risen today! But, as old sinful saints, we are still hunkered down in the dark space. For all of what we and our neighbors see while there—our weaknesses, our sinful habits, our frailties, and all our imperfections—we live still buried in the tomb with His righteousness where His Easter anticipates our own. And in that we hope. He is the Trailer that has already been projected on the big screen of human history; His calling us forth from our slumber—to join Him in resurrection—is the coming Main Feature. Yet even now, decked out in the robe of righteousness, we are the holy, innocent and spotless bride of Christ awaiting His return to take us home. When the Church of Christ has her Easter, when He returns again; then and only then, will the tomb of Jesus be completely emptied. On that day, we will all come forth and shout; We are risen! And our Lord will shout back to us with a big smile, You are risen indeed! And about all this we the Church of Christ can bet all the chips. We can make very certain bet; for behold this Easter Day, the somewhat-empty tomb of Jesus.